Cold Spring Harb Perspect Biol. 2015 Jan 20. pii: a017590. The discovery that extrapair copulation (EPC) and extrapair paternity (EPP) are common in birds led to a paradigm shift in our understanding of the evolution of mating systems. The prevalence of extrapair matings in pair-bonded species sets the stage for sexual conflict, and a recent focus has been to consider how this conflict can shape variation in extrapair mating rates. Here, we invert the causal arrow and consider the consequences of extrapair matings for sexual conflict. Extrapair matings shift sexual conflict from a simple two-player (male vs. female) game to a game with three or more players, the nature of which we illustrate with simple diagrams that highlight the net costs and benefits of extrapair matings to each player. This approach helps identify the sorts of traits that might be under selection because of sexual conflict. Whether EPP is driven primarily by the extrapair male or the within-pair female profoundly influences which players are in conflict, but the overall pattern of conflict varies little among different mating systems. Different aspects of conflict are manifest at different stages of the breeding cycle and can be profitably considered as distinct episodes of selection caused by conflict. This perspective is illuminating both because conflict between specific players can change across episodes and because the traits that evolve to mediate conflict likely differ between episodes. Although EPP clearly leads to sexual conflict, we suggest that the link between sexual conflict and multiple paternity might be usefully understood by examining how deviations from lifetime sexual monogamy influence sexual conflict. Most research on the incidence of extrapair mating — in birds, at least — has focused on trying to explain why males and females might gain a fitness advantage by seeking EPCs. In part because promiscuity is probably the ancestral state, we suggest that it might be profitable to look, instead, at factors that influence the evolution of fidelity in birds and the reduction of sexual conflict caused by EPP. Although within-pair sexual fidelity might evolve for a variety of reasons, there would certainly be advantages from conflict reduction in the short term that might well outweigh the disadvantages of infidelity, some of which we have listed in this review. Thus, we suggest that, in species with biparental care in particular, models that consider the benefits of fidelity balanced against the costs of extrapair mating, including costs due to sexual conflict, might help us to understand the still bewildering incidence of EPP within and among bird species. As has been frequently pointed out, there are many interesting parallels between the natural histories (social monogamy, biparental care) and modes of communication (vocal and color vision) in birds and humans. As for birds, EPP in humans creates sexual conflict that is resolved to some extent by behaviors (mate guarding, kin recognition), physiologies (concealed ovulation), and the advantages of sexual fidelity, particularly with respect to parental care. 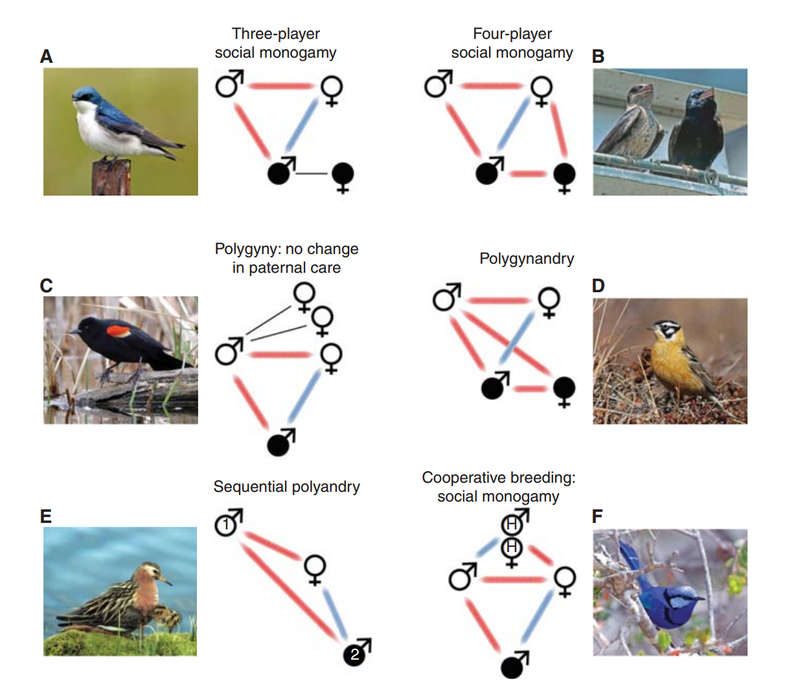 We have focused this review on sexual conflict in birds, but we suggest that the perspectives we have taken here—on the players, changes in conflict across episodes of the breeding cycle, and the traits that evolve to reduce conflict — are generally applicable to the study of sexual conflict in any organism in which females mate multiply.